Jessica Bigler - Switzerland to the British Isles and back! 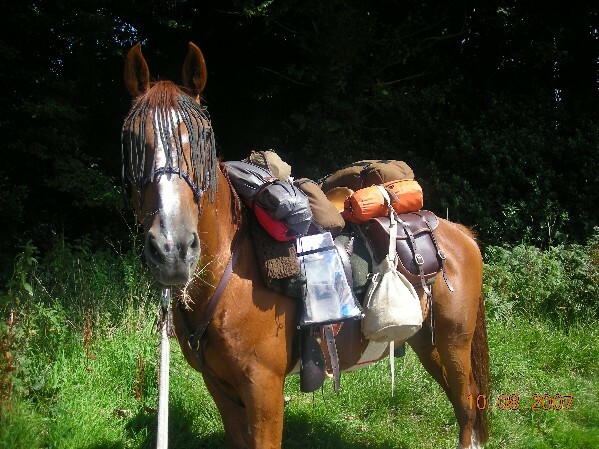 Jessica Bigler is on a long ride from Switzerland to Ireland and back, 7,000km with her horse and a pack-mule. I am writing to give you some news about my long ride ! I finally had to take the decision to give up the idea to undertake this journey with a packed mule. 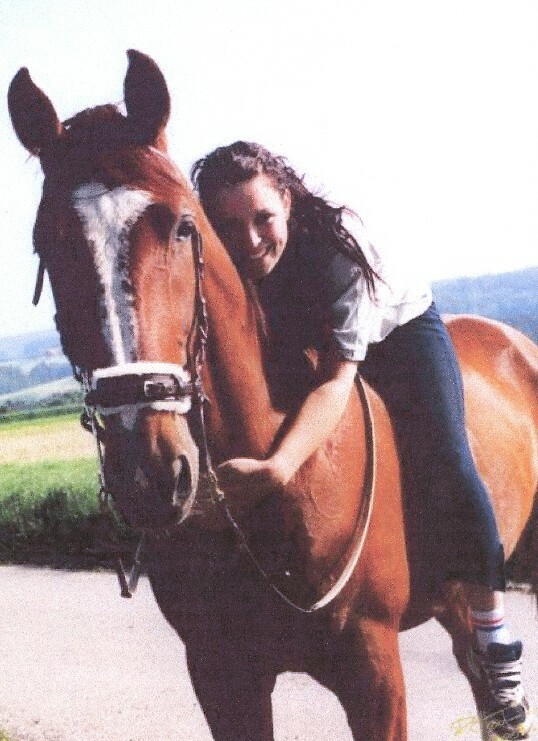 Due to an hernia in my back, I was too weak to train both horse and mule, and the mule was terribly strong and big headed :-) So I took the wise decision to go only with my horse, Gitan, which I have since 5 years now. For the travel I want to make , I don't need to have a packed mule to give me autonomy. 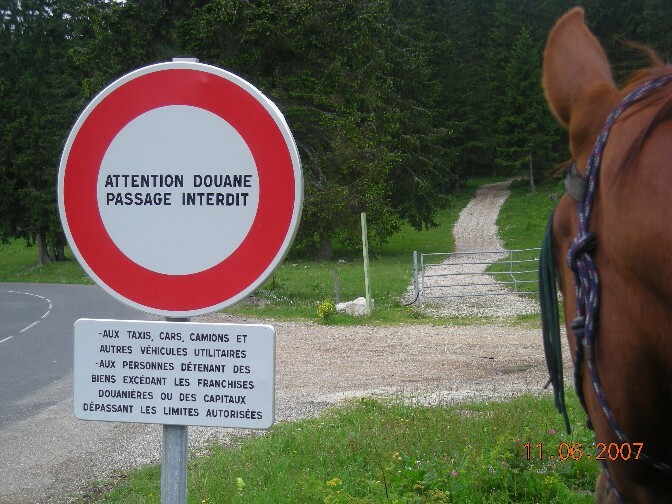 After 4 days in Switzerland, and quite a lot of mountain riding, I crossed the French border on Monday. I didn't see anyone there, only a sign that was indicating that I was now in France. People are really friendly and welcome us to stay for the night. They seem really surprised to see a girl travelling alone with her horse! It's a kind of a dream that I am carrying with me! Anyway, everything is going well, Gitan is doing his job perfectly, he seems to enjoy every minute, and doesn't seem to mind carrying more weight! He enjoys tasting every little grass and herbs that come under his nose, and likes to stop to watch the view ! He is really funny and I am happy to have him for a companion! It's strange to be alone, riding all day, and thinking that you are going to do this for the next months, again and again, it's exciting ! I shall be entering the UK , in Dover, in August ( mid or end of the month ) then I'll be riding to Land's End, before going up to Holyhead , to take a ferry to Dublin. I hope to have the sun with me now and I am really looking forward to riding in the UK ! I'll write again with some more news soon, you'll find some more pictures on my website ! I followed the VIA FRANCIGENA from Switzerland to Calais; The only thing to regret is many paths are not used anymore! No one knows this ancient road ... The landscape is beautiful though ! People in France have been very nice! 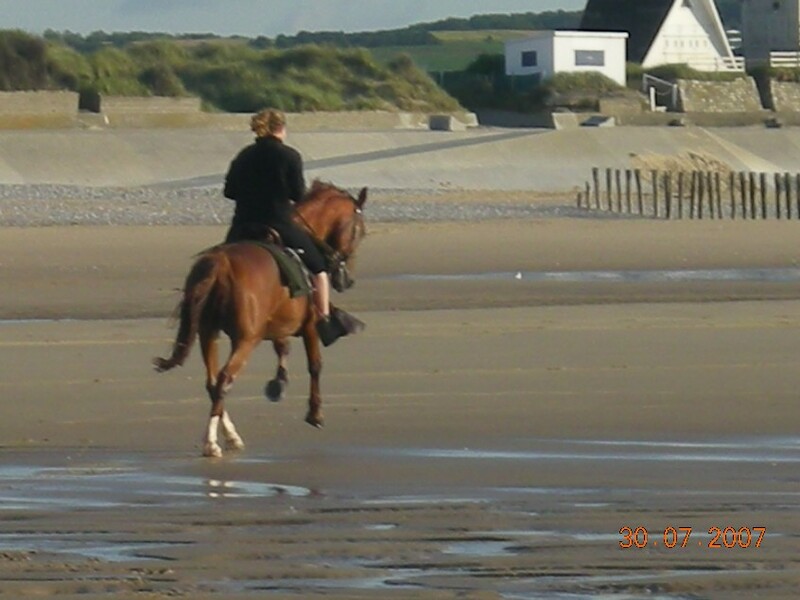 apart from some parts of France, where it's been difficult for me finding food or even hay for my horse. But, going north, I felt the difference, people are more curious and open. They are surprised to see a girl riding alone and are very helpful! I took off lots of material I had in my saddle-bags. After one month and half, I know now that I don't need much to be happy! 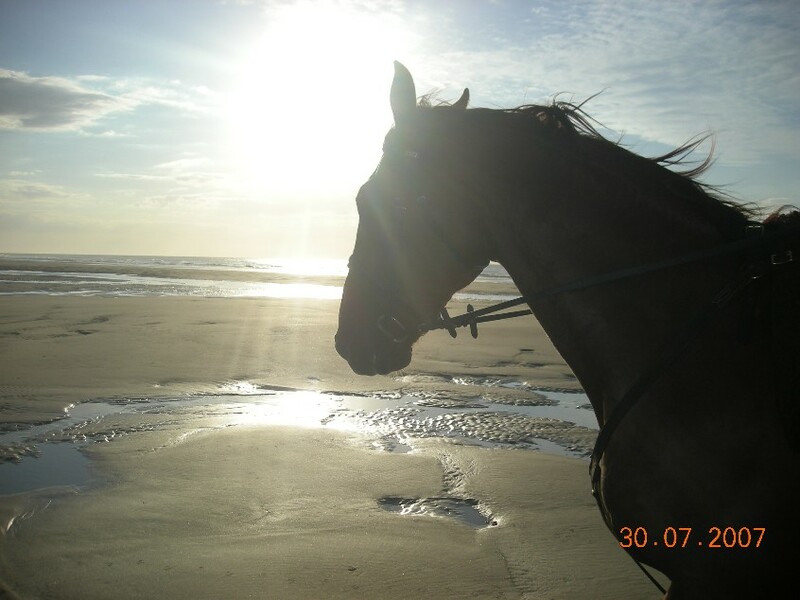 Travelling with my horse, with only the necessary things, it s the best thing I've ever done! I still enjoy it! I hope rain will stop and riding will be ok in the south of the UK ... I am really looking forward to discovering the UK! I'll write again soon with more news! 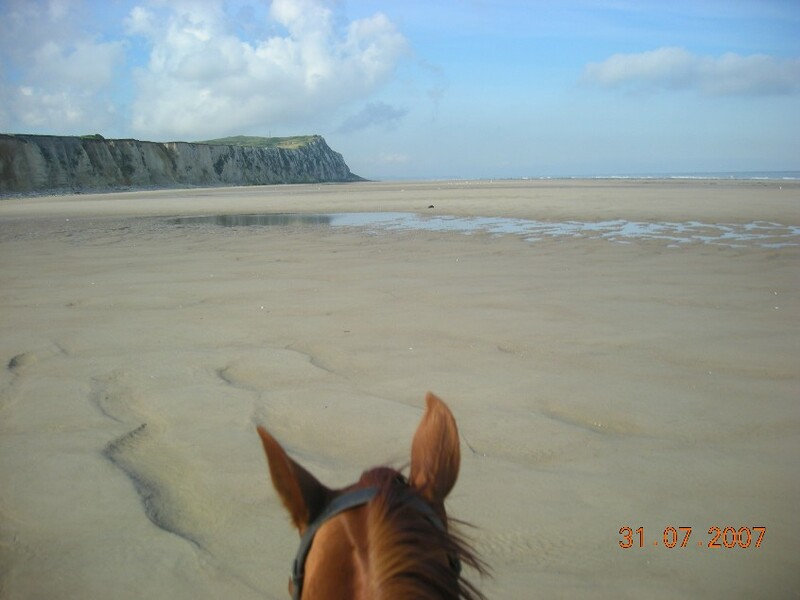 Jessica also sent us some beautiful photographs from the beach in Northern France. Click on any of the images below to enlarge it. August 2007 - Jessica is having the time of her life! Here I am again, to give some news of my wonderful journey! We've had a few problems crossing the border, as DEFRA didnt want us to get on board...As lucky as I am, the foot and mouth disease just appeared the day before, so it's been a bit difficult but then everything went all right. The weather was gorgeous and Gitan didn't seem to care at all, being on a boat! 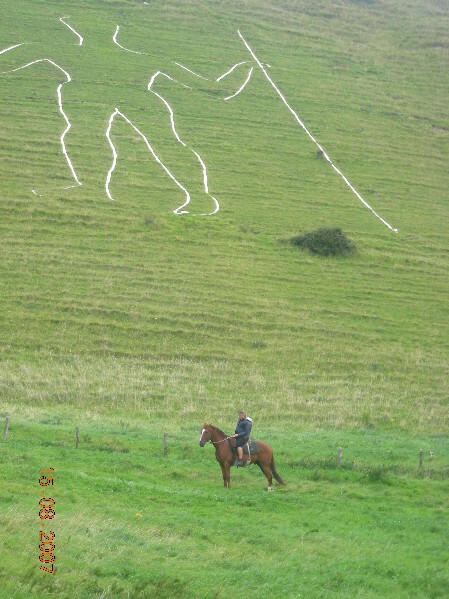 On the 4th of August, I started my English journey, in South Alkham Valley. From there, I rode to Folkestone, Camber, Rye, Hastings, of course I didn't ride through these towns! East Sussex seems very busy, with plenty of roads and lots of cars...I tried to avoid as much as I could the roads, but I couldn't avoid lanes and so we did a lot of tarmac...which isn't very nice for Gitan's shoes... My solution was to put on his 2 front feet the horse boots (Swiss easy boots) ! I must say it's been a great idea to buy these! I've been riding in England for a week and a half now, and I must admit that people here are really friendly and helpful! They seem more interested in what I am doing than the French were...They keep asking me loads of questions and even stop their car to talk to me! Even more enjoyable, the sun has been with me since the first day! 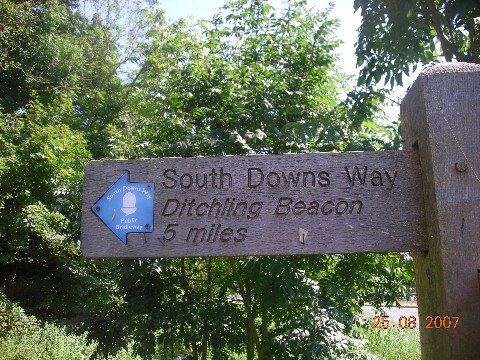 I'll finally enjoy a bit more my ride, as I'll join the SOUTH DOWNS WAY, and hopefully there will be less tarmac! On the 26th of September, after 3 months and a half and 2'000km, Gitan and I reached Land's End! Lucky as we are, the sun was shining and the view was absolutely magnificent. Our picture taken (for those who don't know about it, you can have a photo taken with the famous sign behind you, that shows New York in one side and John O’Groats on the other side. You can write your city and the kilometers you have done to Land's End.) and after loads of photographs, we carried on our journey, walking north along the coasts. The south west of England is beautiful, but not really good for travelling with a horse...The roads are very busy and still a lot of traffic, even though the tourist season is over! Better say that on these narrow roads, you don’t want to ride and being afraid of a car coming too fast round the corner.. as the big hedges don’t allow you to walk on the verge! I has some hard days there and I really started to wonder why I had chosen England !!! Being now near Exmoor, I know why I have chosen England! it is worth doing it once, when you are riding in the Moors - it is just so beautiful that you forget the hard days! When the mist comes, you feel like you are completely lost, it's like if you were in an old film in black and white. Surrounded by some loose horses and sheep, here comes the rain...here we are, it's great! 4 months now that we are travelling, and approx. 2'500km ! Time goes very fast! winter is coming, I gave up my tent and bought some warm clothes instead! I am ready for the wet winter I’ll surely get in Ireland, and I am not going to complain about the weather, as some people are working in their office, and I am free, travelling with my horse...what more could I ask....! Visit my website for some more news, in English! 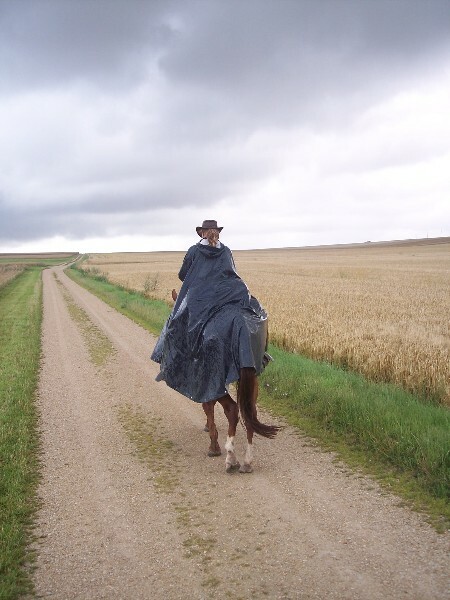 Poor Jessica has been driven away from England and forced to return to France, with its extensive and protected national network of bridleways. 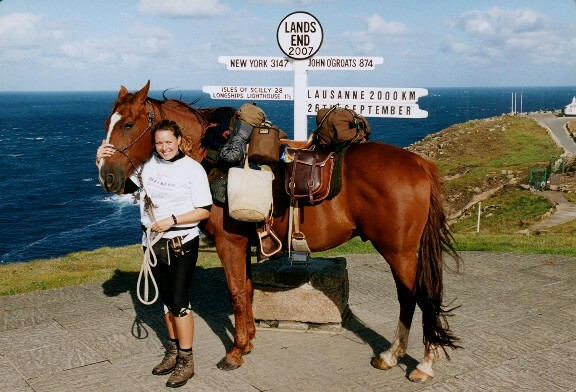 Jessica's plans were to ride from her home in Switzerland, across France to England, all round Great Britain and Ireland, then back home (click on map to enlarge it). But the email below arrived at Long Riders' Guild HQ early in November. 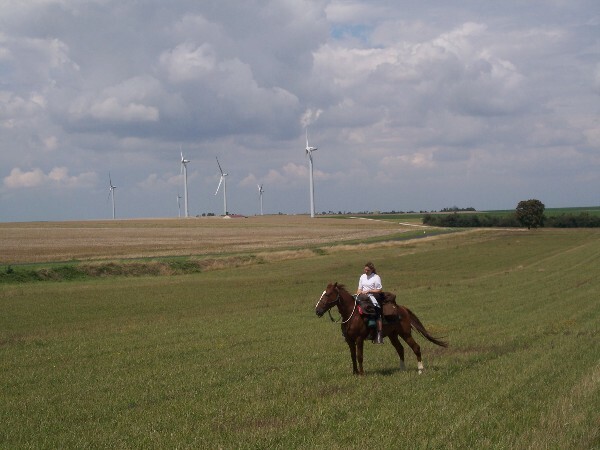 I am writing to tell you that I have decided to go back to France and finish my ride there. England is too hard for my horse. All the bridleways are closed or overgrown, everything is fenced, private, mainly I have to walk on tarmac roads. 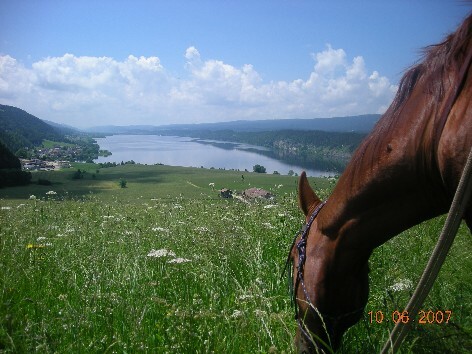 It is very bad for my horse's legs, when it is nearly every day ! No pleasure for us, although the landscapes are beautiful, the people are lovely, it's a shame that nothing is done to help Long Riders who want to ride around the UK ! At least I have met Harry and Lisa Adshead, [the Long Riders who rode from Wales to Jordan] which was great ! Coming so soon after the British Horse Society lost its legal battle with the BMW car company over an ancient bridleway, this is yet more proof of the tragedy of Britain's inability to keep horses off the roads. And how shaming that Jessica has been forced to return to France! A lot of things changed for me and Gitan and I have decided to put my trip on "stand by". My horse was quite tired after the hard time we had in the UK, so I decided he deserved to rest some months. I was a bit upset to go back to France and although I know it was the best decision I could take, still it is a bit hard! I had to think of my horse first of all and I did the right thing for him. Quite right, Jessica - spoken like a true Long Rider. And thank you for the pictures below! For information about Jessica's next Long Ride, please click here. Please click here to go to Jessica's website.